Kilby Bridge to Br 68 near Debdale. 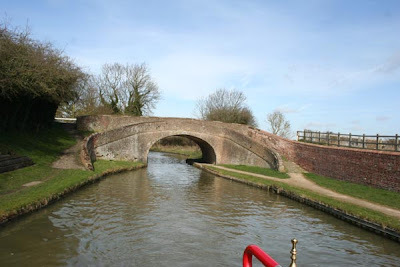 Foxton to Welford Arm Junction. Taken on 6 tonnes of coal. Banbury Lane Bridge to Stoke Bruerne. Fenny Stratford to The Globe Inn. The Globe Inn to Horton. Horton Lock to Marsworth Pair of Locks. Bottom of the Marsworth Pair to the BW Bulbourne Junction. Bottom of the Marsworth Pair to the BW Bulbourne Junction, 2 miles and 9 locks. We set off at 9.05am on what has been a bright sunny day, after a heavy overnight frost. With there being no prospect of someone to share the locks and the workload with, we made our way up the Marsworth pair of locks first, before reaching Marsworth Junction, we were continuing on the main line, but do hope to go off down the Aylesbury Arm at some point. We made a stop off at the sanitary station to empty the toilet cassette, This area is also a BW maintenance yard. 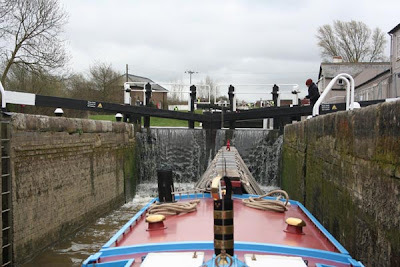 Having emptied the loo, we then had the prospect of carrying on up the Marsworth flight of locks. For a way the Marsworth Reservoir hugs the side of the canal, giving you some sublime views and lots of wildfowl. The Marsworth flight winds it's way up the canal and are really not to difficult to do. Keith and I have a pretty good system when working locks which are close together. I usually work one lock ahead, whilst Keith sits in a lock with Hadar whilst it is filling up with water. I usually walk on to the next one to set it ready. Once I have opened a gate, I then walk back to the previous lock and close the gates behind Hadar. It is one way of getting plenty of exercise, but it is also a really efficient way of working the locks when you have no other boat to share with. We arrived at Bulbourne Junction at 11.10am and moored up near the Wendover Arm. We took a walk up to the local garden centre, to look at their four wheel trolley, which we hoped we could use to carry coal, but having seen it we have decided it would be too heavy to get in and out of the hold. Back onboard I set about cleaning the brass work on the outside and Keith got to grips with cleaning the engine's metalwork. Hadar was then treated to a wash down, so she is looking spick and span for five minutes. A boatwoman's work is never done. Saturday 28th and Sunday 29th March. 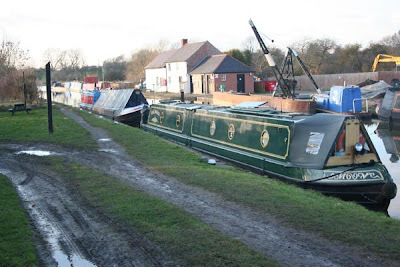 Horton Lock to Marsworth Pair, 2.7 miles 5 locks and 1 swing bridge. 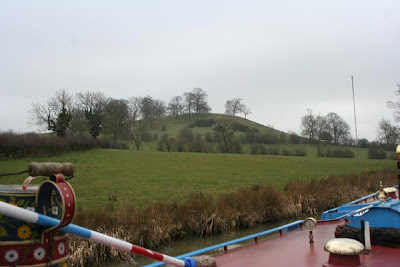 We spent Saturday moored above Horton Lock as the weather was not very nice. We had a howling gale blowing up Hadar's stern, any boats we saw moving were struggling, so knew we had made the right choice to stay put. Throughout the day we had heavy showers, which also included showers of hail. We did very little all day, I did a general clean through the boat, and used my new floor mog to get rid of Paddy's footprints on the saloon floor. 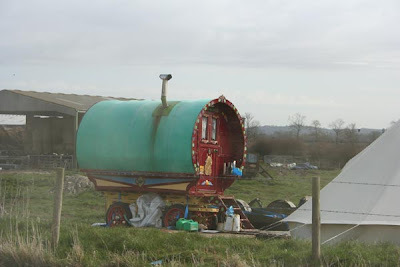 So we had a quiet day, watching the weather and this beautiful Romany Caravan from the galley window. I got down to reading 'Idle Women'. I have got to page 44 and I am really enjoying the book. Susan Woolfitt writes about the no-no of looking into other peoples boats, and it made me think of a conversation we had with a friend sometime ago. He told me that when he was a kid, he was sitting on the roof of his fathers working boat and another working boat passed them. He turned round to watch the boat disappear into the distance and for his trouble he got a chuff around the ear from his father. When he asked what was that for, he was told "You never ever stare into another boatman's cabin, that is their home. It would be like them coming and standing outside our living room window and staring in, do not let me catch you doing that ever again". I wonder how many people still live by that code of boating conduct? We never stare into boaters boats when either passing them or when they are moored up. We only acknowledge other boaters if they wave to us from their windows. We are all entitled to privacy, even if some feel like they live in a goldfish bowl. I am really enjoying 'Idle Women', it is one of those books I think you want to read over and over again. I hope everyone remembered to set their clocks one hour forward. To remember which way round it should be, I always go with the rhyme, spring forward and fall back. We woke up to a bright sunny morning and absolutely no wind at all. The change in the weather from the past few days was remarkable, so we slipped our mooring at 10am and set off for the Marsworth pair of locks. With it being such a glorious morning, we had spendid views across the valley to the Chilterns. No matter which way you look there is fantastic scenery, it made for a very enjoyable mornings cruise. We met boats coming down the locks, so I got to pass the time of day. There were quite a few fishermen out on the towpath, some were happy to say good morning and others did not even acknowledge we were even there. I always like to say hello, just to be polite. The last piece of work for me was the swingbridge at Great Seabrook. For some time there had been a white plastic cruiser moored up on the bollards, but that has finally gone, hooray. We arrived at our mooring for the day at 12.05pm. Having moored up I made us some lunch and we are now enjoying the re-run of the Grand Prix. Congratulations to Jenson Button for his win today. Lets hope he has a great season. Also well done to Lewis Hamilton for taking third, what a sensational drive. Have a lovely Sunday and we will see you next week. The Globe Inn to Horton, 6 miles and 5 locks. We spent a peaceful night outside the Globe Inn, well almost a peaceful night. Today was going to be one of those days when we would change our minds. That is the joy of living onboard and having plenty of time to do as we like. We were going to stay at the Globe Inn, but having got up to a lovely morning we decided we would move off. We do have in the front of our minds that we need to be in Uxbridge for the 11th April and would rather not have to rush later on because we have been too relaxed. For Keith and I our morning began at 3.15am when we were woken up by an ear piercing screech in the darkness. It was clearly from an animal fighting off an attacker, there was then a stunned silence; we could not hear a sound, not even the busy road near by. We could only presume that the animal lost the fight and more than likely became a fox's breakfast. We both went back off to sleep until 6am, when I lay listening to the sounds of the morning. A woodpecker was pounding at a tree trunk in the distance, whilst close to the boat a Chiffchaff, was giving its distinctive version of the Chiffchaff song, then a Collared Dove joined in and it was not long before I was listening to a chorus of birdsong. What a fabulous way to begin the day. 8.15am we slipped our mooring. On our way to Leighton Lock we saw NB Lazy Days, but as it was early no one was around. At Leighton Lock a couple of BW guys were clearing rubbish from behind the lock gates. After the lock we crept past the Wyvern Shipping Company hire boats, which are all looking pristine, ready for the season ahead. By 9am we had arrived at Tesco in Leighton Buzzard, where we did a top-up shop of any extras we needed. Whilst I put the shopping away, Keith checked the propeller, as he suspected we had something wrapped around it. That suspicion was proved correct, with lots of clear plastic and blue rope being pulled out of the weed hatch. Whilst Keith had a good wash after his stint down the weed hatch, I made us a coffee and we headed off. The breeze had now got up yet again, making life a little more difficult. As we headed out into the countryside, we caught our first views of the Dunstable Downs and the Chilterns, where the proud Whipsnade White Lion stands. The Lion was cut into the side of the hill in 1935 and is over 480ft long, it is really impressive. We were getting a little battered by the cross wind, but with Grove, Church, Slapton and Horton Locks being with us, it made our lives a little easier. 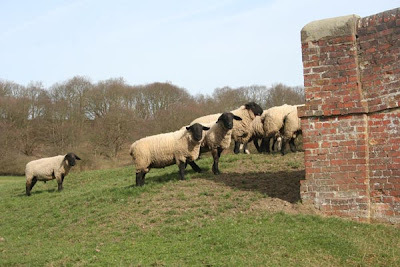 We decided to moor up for the rest of the weekend above Horton Lock, where there are some splendid views across the valley and the country smells from the farm across the canal. Brings back childhood memories. 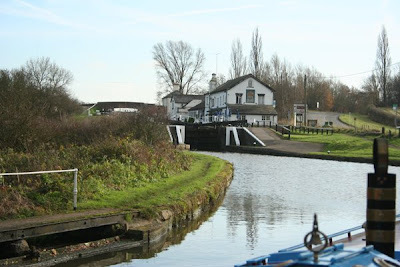 Fenny Stratford to The Globe Inn North of Leighton Lock, 6.2 miles and 5 locks. It had not been our intention to move today, as the weather forecast had said that today was going to be dire, but having woken up to a dry, reasonably bright morning, with little wind, we thought we would make the most of the day, as the weather at the moment is so unpredictable. Having decided to move, I walked down to Roy to let him know of our plans, he was staying put for the day as he wanted to walk into the town. 9.20am we slipped our mooring. I walked ahead and prepared the lock with Roy’s help, we then emptied the toilet cassette at the sanitary station below the lock before heading off into the wide blue yonder. It is always amazing when you revisit places to see that changes have taken place. 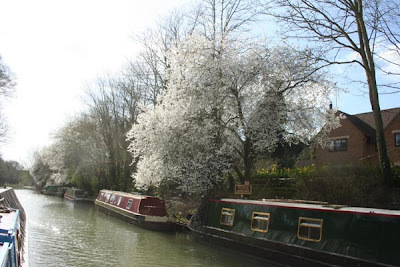 The biggest change was at Soulbury Three Locks and the Three Locks Inn. 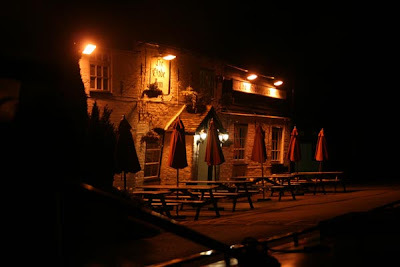 On the 19th November last year when the photo above was taken, I said in a posting the Three Locks Inn, was looking a little sad these days. It could do with a paint job outside and the broken seating replaced, not to mention all the odd curtains up at the windows. It is a shame to see it looking so forlorn, even since earlier in the year it has gotten in a visibly worse condition. 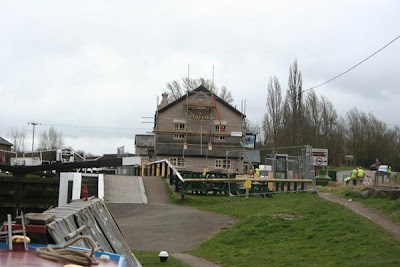 Well someone must have heard me because the Three Locks Inn has become The Grand Union and is undergoing a total overhaul. All the old doors and windows are being replaced, the old place is going to look absolutely fabulous when finished. They have put in a new decked area for seating by the bottom lock as well. We certainly look forward to seeing it when it is finished. It is quite an undertaking in these uncertain times for pubs, but clearly someone thinks that the place is worth a go. As I prepared the first lock an ex-challenger boat was in the top lock, coming down, there were also a dozen British Waterways workers around the locks, with paint scrapers, wire brushes and paint brushes in their hands. The Soulbury Locks were also getting a makeover. This was all very fine and dandy, but it did mean I had to watch where I put my hands and feet. I am not sure it was the best day to be doing paintwork, with rain forecast, but I guess no day is really a good day, when this sort of work needs to be done. There was no shortage of water, it poured over the top gates, whilst Keith waited for me to operate the paddles. We slipped out of the lock, as the ex-challenger boat slipped in and I walked onto the second lock. 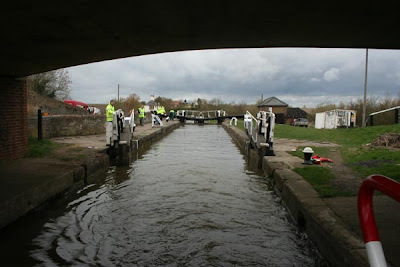 We passed the time of day with the British Waterways work party as we entered the third lock chamber. There was no shortage of helpers to open and close the gates. We left them to their painting and made our way to our destination of The Globe Inn. The scenery is wide and varied, with some lovely views along the valley, as we followed the River Ouzel closely. At times we were joined by the railway. We arrived at The Globe Inn at 12.30pm and moored up outside of the pub, just past Bridge 111. We were last here on the 19th November, when we ate in the pub. We remember it because they were putting up the Christmas decorations around us. 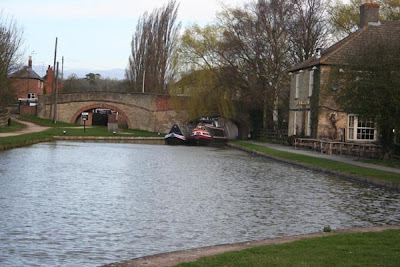 The oldest parts of the Inn were originally the farmhouse and stables, when the canal was built it was converted in to an inn to serve the boaters and licenced in 1830. Near Bridge 111, over £2 ½ million disappeared in 20 minutes during the Great Train Robbery, on the evening of August 7th 1963. The train carrying the bank notes was taking them to be destroyed, but the robbers had other ideas and as they say the rest is history. We had stopped just right, because the weather really began to close in, with heavy rain falling for a while. Milton Keynes to Fenny Stratford, 3.7 miles. It was another bright and breezy start to the day, after a very blustery night. Yet again we were awake early, this time it was 5.10am. Someone once told me that the older you get, the less sleep you require and your sleep pattern is disrupted. I am beginning to think they were right. There was nothing else for it, but for me to get up and make us a cup of tea. After a cuppa we did doze back off to sleep of a sorts before finally getting out of bed at around 7.40am. 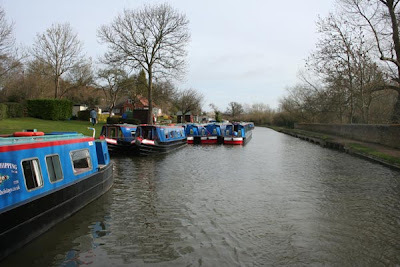 Having done the usual morning stuff, we left our overnight mooring at 8.55am and travelled the 3.7 miles to Fenny Stratford, where we may stay for a couple of days. The jaunt was uneventful, even though the wind was gaining in strength. We moored up at 10.15am and were followed by Roy at around 11.10am. A BW patrol officer came along the towpath checking the boats licences, so I passed the time of day with him. We were enjoying lunch when Hadar was clobbered by another boat. I put my head out of the engine room door, to see who it was to see a BW work boat coming alongside. The BW man steering apologised for hitting us, he said "I am sorry luv, I have a long one and it is hard to handle in this wind". My reply was "You may want to rephrase that", which made him laugh. It was true to say that the wind did blow them into us and I told him it was not a problem, after all Hadar is a working boat. I think he felt a little embarassed. Hadar has had a couple of visitors onboard. Keith's cousin Jill, who he had not seen for many years came to see us. They had a lot of catching up to do over a coffee. It was very nice to meet Jill and we look forward to seeing Jill and her husband Steve on the return journey. Roy came onboard later in the afternoon for coffee and a chat on what the plans are for the next few days. Roy is also going to the Little Venice Cavalcade, so we will definitely be seeing a lot more of him over the next few weeks. It is great because it means we can share locks and the work load. So we will now see what tomorrow brings, but from the look of the forecast we will not be going to far. Cosgrove to Milton Keynes, 6.5 miles. Keith and I were both awake at 5.30am, so Marmite thought it was a good opportunity to climb in under the duvet, where she made herself very comfortable for half an hour. Having tried to doze back off to sleep and failed, we both got up, had breakfast and a cuppa, before I took Paddy out for his morning walk. It was a beautiful morning and thankfully the strong winds from yesterday had dropped considerably. Last night it was blowing a gale, we even had waves on the canal. Around 8am we heard Roy leave on NB Gerald No13, he was heading for Wolverton just like us to do a shop at the Tesco there. At 8.45am we got underway, and by 9.15am we were moored up in Wolverton behind NB Gerald No13. we then donned our rucksacks and walked the short distance to the supermarket, meeting Roy who was heading back to his boat. We told him we would see him later, which we did at Linford Wharf. We tried to moor up with him but it was to shallow, so we moved on to Giffard Park, but it was just the same there, so in the end we have ended up mooring in Milton Keynes at Campbell Park. It is always so easy to spot when you are heading into a more built up area. There is a lot more rubbish floating in the canal and the bridges are spray painted with graffiti. Having moored up, I made us some lunch. We then took the chimney apart on the back cabin stove, to give it a proper clean. Keith used a small crowbar to chip all the tar from the inside of the chimney. We put the chimney back in place and I relit the fire. We will do it again once the fire is put out for the summer. It will then be nice and clean for the Autumn. There is always something that needs to be done when living on a boat. I look like I have been down a coal mine. Just as well I am not the sort of woman who likes nice clothes and manicured nails LOL. Stoke Bruerne to Cosgrove, 7.1 miles 8 locks. Before I begin on today’s ramble. 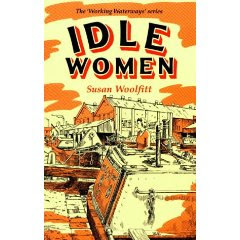 I am really pleased to say that I have now got a copy of ‘Idle Women’ by Susan Woolfitt. Stoke Bruerne Museum shop has a few copies. The book had came back into print a couple of weeks ago, along with ‘The Amateur Boatwoman’ by Eily Gayford. It is a book I have been trying to find. May I thank all of those people who offered to lend me their copy, so that I could read it. Our morning began with the alarm clock going off at 6am. We were making an early start along with Roy on NB Gerald No13. I took Paddy for his walk before we prepared Hadar for the off. There was no quiet way of passing the moored boats, because both Hadar’s and Geralds No13’s engines are thumpers. Keith and Roy manoeuvred the boats to the first lock, whilst I set it for them. Keith roped both the boats together at the bow and stern, whilst Roy switched his engine off. We now had them operating as a pair, which looked fabulous. Keith was really in his element steering the boats down through the flight, whilst Roy and I lock-wheeled. I think it bought back good memories from his teenage years when he worked working boat Pisces down in London. Roy and I were really fortunate that some of the locks already had their gates open, ready to accept the pair, others were almost full of water, meaning we only had to open one paddle and then push the gates open. We did notice that the wind was picking up as we progressed down the flight, which did not pose a problem with the boats breasted up. Having completed the flight we moored up at the Sanitary Station below the last lock to empty our toilet cassette and Roy wanted to take on water. We untied the boats and Keith and I moved off just ahead of Gerald No13 to head for Cosgrove. The wind at times was blowing so strongly that it would take my breath away. It is just as well Hadar was loaded down with coal, because it helped to keep her on the straight and narrow. If she had been empty she would have been blown around a fair bit. We arrived at Cosgrove lock. I set the lock allowing Hadar in first, Gerald No13 then followed. So after a fabulous mornings cruising, we moored up on the 14 days moorings, with the wind blowing a hooley. I had noticed that the back cabin stove was smoking a fair bit, but thought it maybe due to with the wind. I decided to check the chimney for any blockage, and low and behold it was slightly blocked. After giving it a good clean the smoke is coming out of the chimney as it should. Everyone burning coal should always check their chimneys regularly. I tend to do ours once every couple of weeks. Saturday 21st and Sunday 22nd March. Banbury Lane Bridge to Stoke Bruerne, 4.6 miles. The morning began early for me with the sound of a local farmers gas gun going off at 6am, which was not very welcome at all on a Saturday. We seem to have been hearing a lot of these gas guns recently and they have been going off at all time of the day and night. Try as I might I found it very difficult to get back to sleep and when Marmite discovered that both Keith and I were awake, she saw it as her opportunity to get into bed with us. Marmite climbed in under the covers and snuggled down for a time, before we spoiled her snooze by getting up to a lovely bright sunny morning. Paddy even had a spring in his step as we went for his morning stroll. 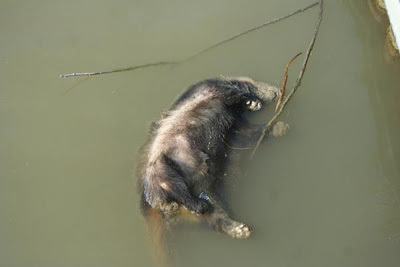 A sad sight was set before us, with a Badger floating on the surface of the cut. It was another casualty of the cut, not many weeks ago we had a fox float past our boat, it is all very sad, because they are both majestic creatures. Back onboard Keith was cooking us a breakfast which consisted of poached eggs on toast with bacon and mushrooms. I always let Keith do the cooked breakfast as he is really good at it. Once the breakfast was consumed, it was time to get on with boat jobs. Keith changed the generator oil, whilst I tidied the boat. For the first time this year we got our chairs out and sat on the towpath soaking up the sun, whilst eating lunch. It was so nice to be able to open the boat up and let a breeze blow through it. Later in the afternoon a chilly wind began to blew in, meaning we would close the boat up and sit in front the TV for the evening. Having heard a not very favourable weather forecast last night, we thought we would slip our mooring and head for Stoke Bruerne whilst the weather was so nice. The sun was out and the breeze was not too strong. So having done all the usual morning jobs, we left the mooring at 9.45am. Boaters who had come past us yesterday, who were out for the weekend, were heading back to their bases. One very nice boater, who we met at a bridge ‘ole waved us through, which was really nice of him, especially as Hadar takes some stopping when she is laden with coal, as she is at the moment. Even though we always slow down when coming to a bridge, as we never know what maybe coming in the opposite direction. It was not long before we were heading through Blisworth and past Blisworth Mill, which I find to be such an imposing building. It is now apartments, but in its hey day would have been a hive of industrial activity. 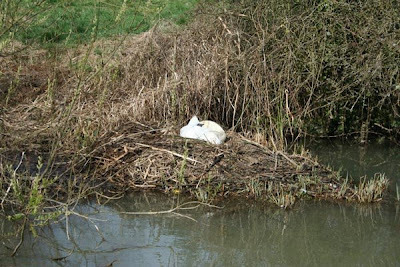 We saw our first swan nest of the Spring, with this swan sitting very tight on what looked like it may have been last years nest, being put to use once more. Perhaps when we come back this way, there may well be cygnets close by. Having made our way through Blisworth Tunnel, we were greeted on the other side by cameras flashing and people staring as we came out into the sunlight. What we did not expect to find was a friendly face moored up on the towpath. 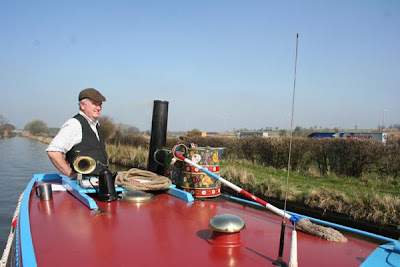 As we came alongside NB Gerald No13, Keith gave a blast on our Klaxon to see if Roy was onboard, which he was as he stuck his head out and gave us a wave. 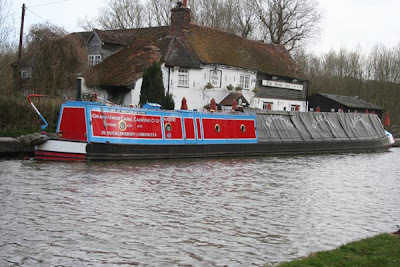 We moored up in front of him and the conversation flowed, we then got on to the subject of lunch and the fact that Roy was going to The Boat Inn, so we thought what a great idea and so closed the boat up and joined him for lunch, which I have to say was fabulous. The beer and conversation flowed before, during and after a lovely meal. We were even joined by Mike from NB Jubilee for a few moments, but he could not stay as he is now running the trip boats from the museum, but I am sure we will get to chat to him another time. It is fantastic to see Roy again and Thomas his very handsome whippet, who is so well behave. Back at the boats we were then invited onboard Gerald No13 for a coffee, where the chatter was still flowing strongly. We have not had a chance to natter to Roy since the BCN Explorer cruise last year, so as you can imagine we had a lot of things to tell each other. This is the great thing about meeting up with friends, there is always plenty to natter about. It has been a marvelous day, with lovely weather. Spring is really busting out all over with blossom on the trees. 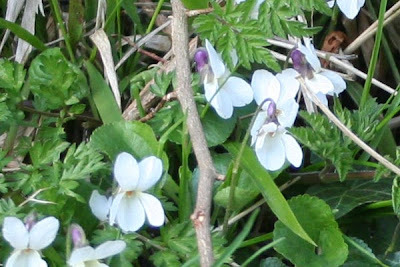 Spring blooms are to be seen everywhere, Daffodils, Primroses and my favourites Purple and White Violets. They have such delicate petals, which snuggle down in the grass. It has been the most perfect day. It is thought that we may set off early in the morning to travel down the flight with Roy. We will breast up with Gerald No13, Keith will move both boats whilst Roy and I lock wheel, so it should be a great days cruising. Nether Heyford to Bugbrooke Downs near Banbury Lane Bridge 43, 2.8 miles. Before bedtime I set our alarm clock to go off at 6am, so that we would be up nice and early, as we were due to begin taking on coal at 7.30am. Something however told my body clock to go off at 1am; there I was wide awake dead on 1am grrr. I could not believe it when I looked at the clock. I then spent ages trying to go back to sleep, by the time I reckon I got off; our alarm was beeping at us to wake up. Marmite saw it as her opportunity to jump on the band wagon, by jumping on Keith and meowing in his face, just in case we had not heard the alarm clock. Bleary eyed I crawled out of bed and got dressed. We rolled the bed up into the bed’ole and shut the cupboard door. It was then time for breakfast and Paddy’s walk. Both he and Marmite even had their breakfast early, so they will be screaming for their dinner later on as their tummies will be totally empty. At 7.30am John opened up the coal yard, and filled us up with diesel first. Hadar swallowed 406 litres, which was darn good because we last filled up in November whilst in Stone. With the diesel done it was then time to load the empty hold. Before dinner last night we had rolled the sheeting up on the hold so it would be already to load coal into. In all it took us 1¾ hours to load 6 tonnes of coal into Hadar’s hold. That is 2 tonnes of Taybrite, 2 tonnes of Cosycoke and 2 tonnes of House Coal; all in all we have almost 7 tonnes of coal onboard as we had 37 bags of coal left over from our last intake. Keith and I took it in turns on the bank and in the hold, each doing a stint at stacking. We have developed a very good system, so it does not take us long to hand load coal these days. Once the hold was all sorted out, I had to go and pay for the coal, whilst Keith paid for the diesel and a new bottle of gas. We spent sometime chatting to both John and Richard, meaning we did not leave the yard until 10.50am. Our aim was to find somewhere to moor for the weekend, which ended up being near Banbury Lane Bridge. 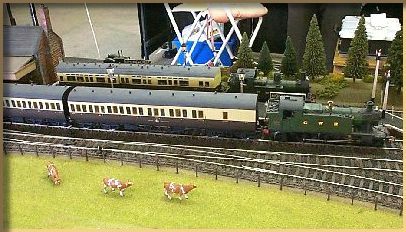 We are over looking the railway and fields with horses in. The sun is shining and all is right with the world in our eyes. 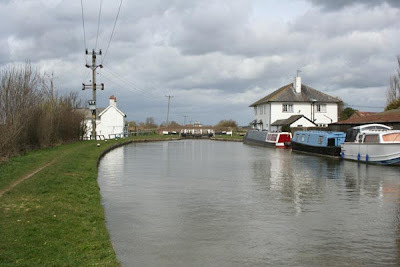 Norton Junction to Nether Heyford, 7.2 miles and 7 locks. After an overnight frost, we woke up to a pea soup view from the back cabin. There was a real chill in the air as I took Paddy for his walk, but no sooner had we stepped off of the boat, the sun was trying to poke its face through the fog. As we strolled along the towpath, I could feel the sun warming my back, so it was looking good for another nice day. As we arrived back at the boat, Keith was already preparing Hadar for the off and by 9.10am we were setting off back onto the Grand Union, leaving the Leicester Arm behind until October, when we will hopefully be back to do our winter coal run. As we made our way to the first of the Buckby Flight, a Rose Hire boat was coming up through the first lock. I stood and had a lovely conversation with the couple on the boat, who were hiring for the second year and enjoying every moment. I helped them operate the paddles before wishing them well as they carried on with their holiday. Also at the lock were six BW workers enjoying their morning tea break, one of them shut the gate as we left the lock, which was very gentlemanly of him. I said thank you before joining Keith on the stern. Sadly as usual we were alone descending the flight. There never seems to be anyone to share with. At lock two there is a canal shop housed in Anchor Cottage, it has lots of canal ware and gifts, we stood chatting to Tricia the owner whilst the lock filled. The shop is filled with wonderful canal ware, lace plates and other canal related items. It is really worth popping into even if it is just for an ice cream. As you descend the Buckby Flight you cannot ignore the motorway, it is so noisy as it runs alongside the canal. Even after leaving the Buckby Flight at Whilton Marina, you can still watch the speeding traffic for sometime, it makes us so pleased that we live at such a slow pace and have no need for a car anymore. Now that Spring is really in the air, it means that the trees are now developing their leaves and the grass is beginning to grow once more. The contractors for BW were out cutting the grass on the towpath and strimming the edges, which seems earlier than we have seen them in previous years. Maybe they are making an early start this year. We arrived at High House Wharf at 1pm, where we moored up and went to visit friends Elaine and David on NB Patience. Unfortunately David had to go to work, but we sat chatting and drinking coffee for a couple of hours with Elaine. It was really lovely to catch up on all their news and to go some way into putting the world to right LOL. We look forward to seeing them again possibly in June. After leaving Elaine we cruised on to Nether Heyford and Fred Tarry’s Coal Yard where we are due to take on 6 tonne of coal. We spent some time chatting to Richard our coal merchant and made arrangements for taking on our coal in the morning. Labels: Fred Tarry's Coal Yard, Nether Heyford. NB Patience. Crick to Norton Junction, 4.9 miles and 7 locks. We stopped at Norton Junction for the day at 11.35am, so you could say it was just a short hop for us, but we did it in some of the best weather of the year so far. When we woke up, it was to the birds singing to their hearts content. The sun was shining through the pigeon box, so we knew it was another good start to the day. Once we were up, dressed and the usual morning jobs done, we reversed Hadar over to the water point to top her up for when we take on our coal delivery, as we like the water tank to be full and on this occasion the diesel tank will be full as well. We set off at 9.15am for Crick Tunnel, and met another boat coming towards us in the tunnel, apart from that our trip was uneventuful. We arrived at Watford Locks, I stepped off of the boat and walked down the flight to find the lock keeper, who gave us the all clear to proceed down the locks. He actually walked up and set a couple of the locks for us, which was very nice of him. It was then on to Norton Junction where we ended our journey. Lunch was eaten alfresco, as it was too glorious to sit inside. I took the opportunity to sweep the boat out, brush the mats and clean the exterior brass once again. Marmite and Paddy both made the most of the sunshine, with Paddy laying on the back counter and Marmite on her new extendable lead prancing up and down the towpath, terrorising the birds in the hedge. It really does not get much better than this as far as the weather and cruising is concerned, long may the sunshine continue, well at least until after the weekend, so we can take on our coal and find a nice spot to moor for the weekend. Welford Junction to Crick. 10.6 miles. Having had a lovely nights sleep, on a very quiet mooring, we got up to a chilly, breezy start, but we were both looking forward to cruising to Crick, because Crick was where our waterways adventure began in January 2005, when we picked up NB Misty Lady our old boat which we lived on whilst Hadar was being built. We bought NB Misty Lady from ABNB, which is where we would end up mooring opposite at the end of the days cruising. Our days cruising began at 9.35am as we slipped our mooring and headed off into the countryside once again. 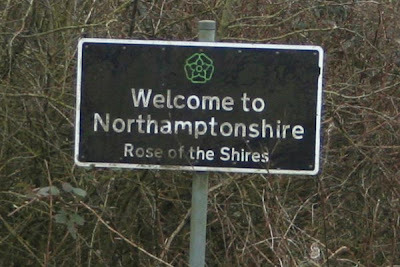 We were welcomed into Northamptonshire once more by the sign on the canal bank. We both love the Leicester Arm, it has a beauty all of its own. The landscape was broken up from time to time by woods on both sides of the canal, where the trees are now showing signs of waking from their winter slumber. Sadly bridge 32 was not looking so great, and is in need of some extensive repairs. I have in past postings gone on about how bridges get damaged, but it is true to say that not all bridges are damaged by boats clobbering them at speed. Some sustain their damage by heavy tractors crossing over them from field to field. There were some other boaters moving towards Foxton, a sure sign that the weather is on the up. Whilst on the move, I put some sausages into the back stove, so that they would be cooked in time for sausage sandwiches for lunch. I also put the kettle on for a coffee. Once it was boiled I made us both a coffee and filled the coffee pot up and left it to keep warm on the stove, so it would be ready for lunch time. I am so pleased we bought the coffee pot, it is really useful. We knew we were approaching Crick because Crack hill came into view. Crack’s Hill is situated between the villages of Crick and Yelvertoft. Crack's hill was created during the last ice age when melt water deposited material underneath the ice. Once the ice sheet retreated it left this pile of silt and rock behind, the hill is properly called a moraine. Worked flints from the Neolithic period have been found on the hill. It has also been rumoured that the Romans used the hill as a sentry point. 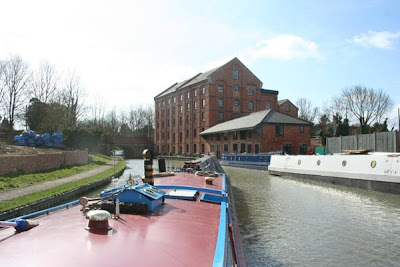 It was not long before we arrived in Crick, where we moored up opposite ABNB. Crick takes its name from the Celtic word for 'hill' ("Cruc"). After lunch and a coffee, we walked into Crick, where there are three pubs, a co-op and post office. Crick also has a beautiful church. St. Margarets Church dates back to the Norman times, it has seen changes through the years. One of the first things you notice is the difference in the colours of the stonework. The tower is red sandstone from Hartshill and the rest of the church is a honey coloured stone. Whilst walking around the church it was obvious that some of the windows have been put in crooked and one of the walls leans outwards. It is a real must see. The village itself is really lovely, a mix of old and new, thatched and tiled houses. So having enjoyed a nice relaxing cruise, we are now settled in for the evening. Whilst walking through Crick, I spotted this notice on one of the villages notice boards, and thought that it was a really good idea. 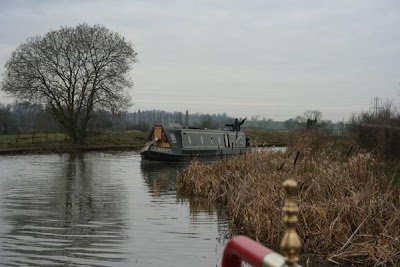 Foxton to Welford Arm Junction. 8 miles, 10 locks and 1 swing bridge. We spent a fantastic weekend at Foxton. Saturday was a little on the breezy side, so we did not bother with boat jobs, instead we took a walk into Foxton to have a look around. 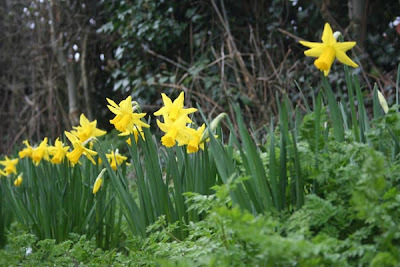 These fabulous Daffodils were growing along the towpath, bringing a burst of sunshine to the banks. 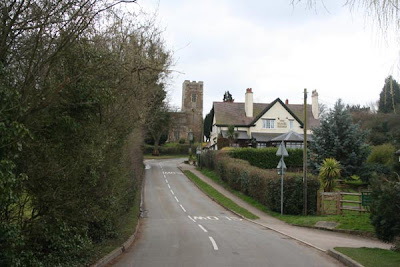 Foxton is a really pretty village, made up of old and new properties, numbering around 480 at the moment. It has a stunning church which overlooks the valley and The Black Horse pub. St. Andrews church tower dates back to the 13th Century. We took a stroll around the grave yard, where there are a number of family plots dating back to the 1800's. We enjoyed our walk, as did Paddy. We spent the rest of Saturday relaxing and watching the TV. Sunday morning we were awake and up early as we wanted to get a few boat jobs done. One being the paintwork on the back cabin doors, which needed attention. So having walked Paddy and had our breakfast we set about rubbing down the paintwork and applying new paint. With the weather being so fantastic, there were plenty of people walking the towpath. Having got the paintwork done, it was time to clean the exterior brass, clean out the engine room and give the boat a general tidy. Who said Sunday was a day of rest? On Sunday Foxton was holding its first ever Seedy Sunday. It was held at the Robert Monk Hall. Seedy Sunday offered people the opportunity to swap their unwanted seeds for seeds from other gardeners. I think it is a brilliant idea. Foxton Seedy Sunday was awarded £1500 grant by Awards for All England, a joint Lottery grants programme supported by Arts Council England, Big Lottery Fund, Heritage Lottery Fund and Sport England. I hope it was a success. They certainly had the weather for it. Today we awoke to another glorious morning and by 9am we were ready to set off up the Foxton Flight, which is now manned by a lock keeper until the end of the summer, so if your planning on going up or down the flight you have to speak to the lock keeper Terry first. We made our way up the flight and were at the top by 10am, where we said cheerio to Terry and BW worker Bill, who we have got to know whilst we have been on the Leicester section. 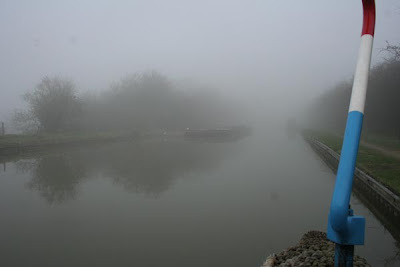 On this section of the canal, there is plenty of stunning scenery to look. We were also being studied by the local farm animals. These sheep were fascinated by us. When we did this section on the way up it was a very foggy day, so we never got to see the rolling hills, where the trees stand like naked statues, quivering in the breeze. It is really quite beautiful. Every since the Autumn we have hardly seen any other boats on the move, but today we saw six. It seems that now the better weather is here (fingers crossed), people are beginning to make a move. 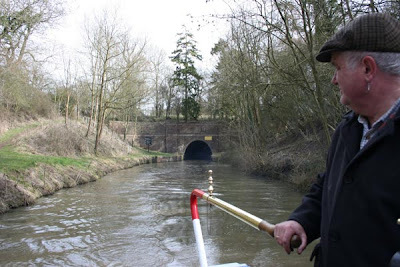 We arrived at Husband Bosworth Tunnel, to see another boat exiting the mouth of the tunnel. As we swept into the darkness, I stood down in the engine room, where I could see in front of us another boat. Unfortunately they did not appear to have any stern lighting, so I could only make out their outline. It turned out to be a Canaltime hire boat once we arrived out into the sunshine. 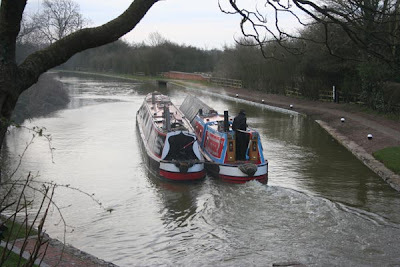 They went down the Welford Arm after overshooting the junction and we moored up for the day. After some lunch, I went stick collecting, whilst Paddy and Marmite played out on the towpath. it is so quiet here that they will not be bothered by anyone else. it has been another fine day and the week looks set fair, so we should make it to our coal merchant by the end of the week. Bridge 68, Debdale to Foxton. 1.9 miles. Before leaving our overnight mooring with Mo and Vanessa on NB Balmaha, we got together to say our goodbye’s, because Mo and Vanessa would be stopping at Debdale Wharf for diesel, we would carry on to Foxton where we would stay for the day. Mo and Vanessa came past us later in the day on their way up to the Foxton flight of locks. We decided to have lunch and then take a walk up around the Foxton locks, because the weather was so lovely. I bought an enamel teapot and coffee pot from the shop below the locks. I want to use them in the back cabin. 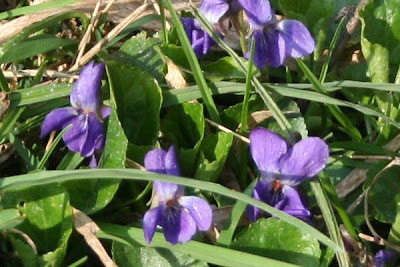 It was a real spring day, warm with sunshine, no wind and sunny spells. Not only was the weather nice, the Daffodils are in bud, ready to bust into flower, Violets are in bloom, with their delicate, scented purple flowers, and the Primroses are in full flower. It does not get much better than this. Foxton to Market Harborough and back again. 11.8 miles. We were both awake early listening to the bird song from the hedgerow. Through the port holes on the pigeon box I could see that the sun was shining, announcing another fine day. Marmite soon realised we were both awake, so she jumped on to Keith’s chest, sat herself down and meowed into his face, to make sure he knew that she wanted him up, so she could be fed. Having got up, I raked the back stove fire, before getting ready to take Paddy for his morning stroll. After breakfast we readied Hadar for the off, I then walked up to open the swing footbridge for Hadar to pass through. We only encountered one other boat moving on our way into Market Harborough and they were coming out from the town. The journey is a pretty one with panoramic views across the valley, which can be seen easily at this time of the year, with no foliage on the trees and bushes. Keith spotted a lonely mooring hook, still attached to some piling. Someone had clearly left it behind, so we added it to our growing collection. In all it took us 2 hours to get to Market Harborough, where we winded in the basin before emptying the toilet cassette at the sanitary station. Having moored up on the 48 hour moorings, it was time for another coffee out of the new coffee pot I bought yesterday. It is wonderful because I can fill it up with coffee and keep it warming on the back stove whilst we are on the move. We donned our rucksacks and walked down into the town, where people were milling around in fancy dress for Red Nose Day. In Specsavers they were doing a sponsored walk on a treadmill. In Sainsbury’s a lady was sat in an inflatable car filled with custard, to raise money for Red Nose Day. We did not hang around, as we wanted to have lunch and then move off no sooner we got back to the boat with the food shop. So with full rucksacks we walked back up to Union Wharf, and settled in back on Hadar. I put all of the shopping away and then made us some lunch. We then set off back to Foxton. The weather towards the end of the day turned quite chilly and overcast, so when we stopped at 3.35pm at Foxton, we did not stay outside for very long. We will stay here for the weekend, and then on Monday we will be heading up the Foxton Flight. Kilby Bridge to Br 68 near Debdale. 7.8 miles and 12 locks. Yesterday afternoon we moved Hadar over to the Sanitary Station, to take on water, empty the toilet cassette and dispose of rubbish, having done this we then moored up behind NB Balmaha, so we would be ready to move off in the morning. When we got up this morning it was extremely foggy, but as the sun came out, it did not take long to burn the fog away to leave us with a bright, chilly start to the day. It was an ideal day for cruising with Mo and Vanessa on their boat NB Balmaha. We were about to set off at 9am but a Canaltime hire boat beat us to the draw and slipped their mooring first, which meant we would have to follow in their wake. It was a united decision that we would give them a 15 minute head start before we would set off, as we did not want to be caught up with them at the locks. This seemed like a great idea at the time, but proved not to really work out in practice, because after their first couple of locks we were right on their tail. But as we approached Newton Top Lock, they were pulling away from the lock and moored up past Bridge 80 Newton bridge, so we thought yippee we can get in front of them and make some headway. An Oxfordshire hire narrowboat and a private owners boat NB Faraday, entered the lock to go down, leaving the lock clear for us and Balmaha to come up. We were literally ready to leave the lock when the Canaltime pulled out in front of us grrrrr. They had probably stopped for a coffee LOL. So we were back to following them through the next five locks. Keith and I had such a lot of fun cruising with Mo and Vanessa, they really made our day lots of fun. I certainly found working the locks, with Vanessa a real pleasure, it was nice to be able to chat whilst we worked. 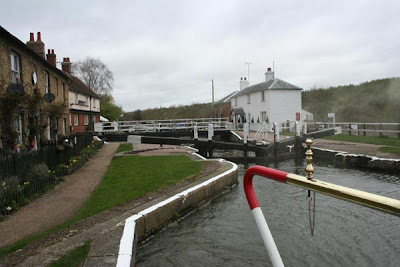 As we followed the hire boat up the next set of locks, it became apparent that the pounds were low and by the time we arrived at Kibworth Second Lock, the hire boat had got stuck coming out of the lock, as the pound was down by a foot and half. 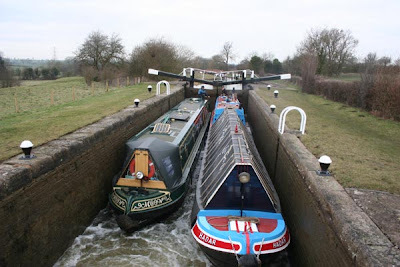 They managed to get moving towards Kibworth Top Lock and we began to fill our lock. 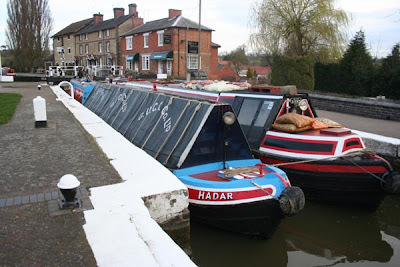 Mo moved out of the lock first, because Keith was worried that Hadar would get stuck heading towards Kibworth Top Lock and that happened no sooner he left the lock. Vanessa and I walked up to the top lock and began to let water down to get Hadar refloated, eventually she was once more on the move and Keith managed to get her into the lock. All of this excitement made for an excellent day. We cruised through Saddington Tunnel (880 yds). It is worth looking up when going though the tunnel, because inside the tunnel there are bat boxes that have been put up. Mo and Vanessa followed us through the tunnel, which we worried about a little because we know how loud Hadar's engine can be. That is why we wear ear plugs, but later on Mo told us it was not actually that bad, which was good to know. After a lovely day we both moored up before Bridge 68. Vanessa very kindly invited us onboard their boat for a cup of tea, which I reckon we had earned. it was not long before Vanessa and I were yawning, we had both worked hard. Sitting drinking tea and chatting with friends, is the best way to finish a brilliant day. We really look forward to cruising with them again, they are a lovely couple and lots of fun. Before I finish todays posting, I thought I would show you Keith's latest creation. 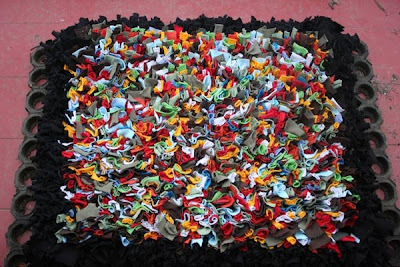 Keith finished our new Rag Rug yesterday evening, which took 7 days to complete. He based it on all the colours in our back cabin. It really looks fabulous. He will have to make another one now. Labels: Balmaha, Debdale., Kilby Bridge, rag rug. We have enjoyed our 14 days at Kilby Bridge, it is now time to move off. We received a text message from T-Mobile today to say my mobile modem is fixed which is excellent news. They will now post it to our base address and we will have it sent on to us, when Hadar is having her bottom blacked in April. Tomorrow we will be moving off and we will not be going alone. We are going to share the locks and the journey with Mo and Vanessa on NB Balmaha. They arrived at Kilby Bridge a few days ago, and joined us onboard Hadar for a cuppa and a chat. Mo and Vanessa are a lovely couple and we could chat to them for hours, which is pretty much what we did, as the time flew by. They are looking to move off tomorrow as well, so it seems sensible to share the locks and the hard work. We have really loved our time at Kilby Bridge, everyone has been so welcoming and nice. I even got to see a Kingfisher close up whilst having a coffee with Alison on her boat. The Kingfisher settled on the BW work boat, no more than 8ft in front of us. It was amazing to be that close to such a magnificent little bird. The following day I was working in the back cabin when I heard a screeching commotion going on outside, so I popped my head out of the door and there scampering along the towpath was a stoat. I reckon it was running from something, but could not see what. That is now my second encounter with a stoat. I never realised just how tiny they were. 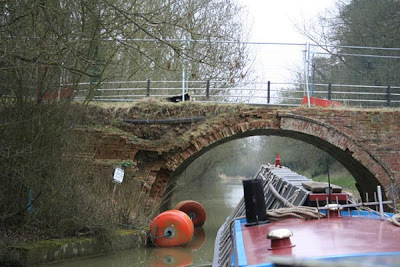 So we will say goodbye to Kilby Bridge in the morning, heading back to Wistow and Foxton. The day before we arrived at Kilby Bridge a swan was shot out of the sky on Monday 23rd February. Alison the mooring warden's wife told us that a swan had been shot and killed. It's mate was found close by and is now being looked after by the Foxton Wildlife Rescue. If anyone has any information they should contact the RSPCA. The swan was killed at Kilby Bridge, on the Welford Road, Wigston. A fisherman heard a loud bang about lunch time, he then saw the swan fall from the sky into a field close to the Navigation Inn at Kilby Bridge. The male swan was later found with a wound to the stomach and through the wing, which is suspected to have been caused by a shotgun pellet. The dead swan’s mate, who was flying alongside him, was found uninjured and sitting next to his body, she was taken to Foxton Wildlife Rescue. As many know swans tend to stay with the same mate for life, so this is very tragic. It seems though that this female has already got her sights set on a new mate at the centre. Once the centre has monitored her for a while they will release her into a family of swans, and lets hope that she lives a long and happy life. Those responsible for the swans death if found guilty of causing unnecessary suffering to this beautiful creature, could face a maximum six-month prison sentence and/or a £20,000 fine under the Animal Welfare Act 2006. Killing or injuring wild birds is also prohibited under the Wildlife and Countryside Act 1981 and carries a separate punishment of six months in prison and/or a £5,000 fine. I sincerely hope that someone is caught for this and punished.